After losing her mother very early in life, Anna Atkins (1799-1871) was raised by her loving father. He gave her a scientific education, which was highly unusual for women and girls in the early 19th century. Fascinated with the plant life around her, Anna became a botanist. She recorded all her findings in detailed illustrations and engravings, until the invention of cyanotype photography in 1842. Anna used this new technology in order to catalogue plant specimens – a true marriage of science and art. In 1843, Anna published the book Photographs of British Algae: Cyanotype Impressions with handwritten text and cyanotype photographs. It is considered the first book of photographs ever published. 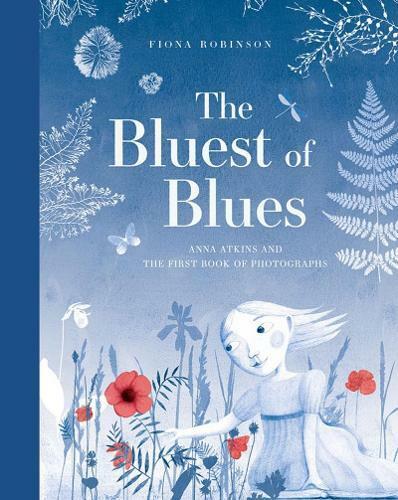 Weaving together histories of women, science, and art, The Bluest of Blues will inspire young readers to embark on their own journeys of discovery and creativity.